Congrats to G-Money on being the lucky winner of the (6) 2018 Baseball Treasure Coins Pack Contest. Once G-Money sends me their mailing address, Baseball Treasure will ship these packs ASAP. Thanks! This contest is for six (6) sealed packs of 2018 Baseball Treasure Coins. 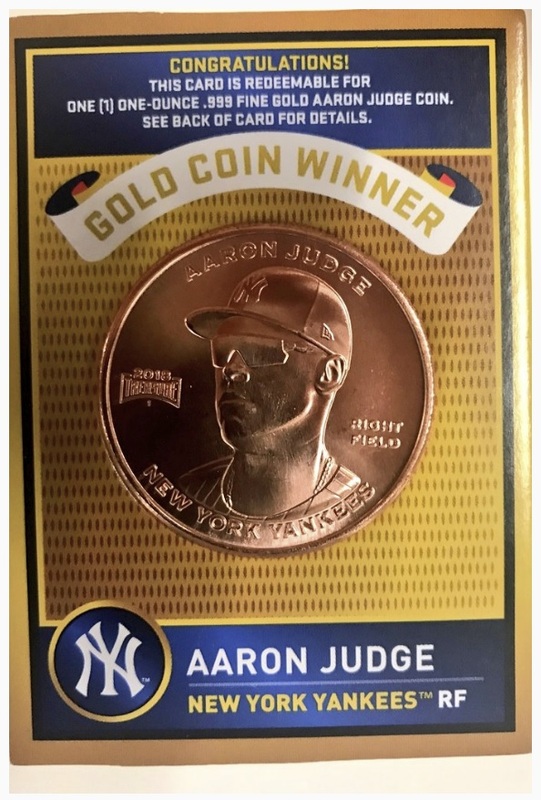 Inside each pack there is one (1) officially licensed MLB player coin. Base set coins are made of .999 fine copper. 1:432 packs have a silver coin. 1:21,600 packs have a gold coin. Thanks to Baseball Treasure for offering up these packs in celebration of Sports Card Info’s 11th anniversary. Good luck!!! This contest will end Friday, January 4, 2019 @ 8:00 p.m. EST. Once the contest is over, I will need the winner’s mailing address so Baseball Treasure can ship these packs for FREE!!! Congrats to y2jbrak on being the lucky winner of the Adam Jones 2018 Baseball Treasure 1-ounce copper coin card. Once y2jbrak sends me their mailing address, I will ship this card ASAP. Thanks! Thanks to shows like Pawn Stars, sports memorabilia has been getting its share of prime time coverage. I usually make it a point to watch if I hear that a sports related item is going to be featured in one of their segments. One of the newest shows that deals with collectibles began this month on CNBC Prime called Treasure Detectives. In this show, experts take a look at specific items brought to them by individuals and they determine whether or not the item is real or fake based on a handul of forensic tests. The hour long program usually swaps back and forth during the investigation process between the two items that are in question. Its a refreshing show that doesn’t focus mainly on the item’s value, although dollar amounts do pop-up when they talk about what the item could potential be worth if it is determined to be authentic. In the second episode, part of the show covers the Cobb-Edwards 1909-11 T206 Honus Wagner tobacco card. Out of the 50 or 60 examples that exist today, this one has been in question for years. According to Edwards, it was purchased from someone who obtained it at an estate sale in 1980. Before that, there isn’t too much history on how the card surfaced or who owned it. It was originally purchased supposedly for $1,800.00. Over the years the card has gone through a handful of tests each coming up with vague yes-no determinations. Eventually it landed itself in an ACA Grading holder which deemed the card to be authentic. Why would they use ACA Grading to authenticate their card? Most likely because they were the only company willing to touch the card and say it was real. ACA probably wanted some attention from the hobby too. For a majority of the show, Mr. Edwards wouldn’t let the examiners remove the card from it’s holder. It wasn’t until the end where they brought in the individual from ACA Grading who encased the card and asked him to remove it so they could take a closer look under a microscope. While taking a look at it with the microscope, you could clearly see the print pattern on the Cobb-Edwards card was not consistent with other T206 cards from the same set. The font and spacing was off too. One of the best ways to determine if a T206 card is counterfeit is to compare it to another common card from the set. These cards were originally made as promos, and were expected to be thrown out. They didn’t go out of their way to make some cards better looking than others. Scanning the card in the CT scanner revealed that there was a potential bulge near the middle indicating that there might be more than one piece of paper present. Given that the card was still in its holder at the time of the scan, they indicated that their measurements could be off. I personally don’t buy that for a second. CT scanners are designed to see through skin, muscle, tissue, and bone. Not to mention tumors deep within the brain. A little plastic holder shouldn’t be a problem. Then again, I’m no doctor. It was interesting to watch the show’s experts go about making a fake. The end result was a spot on match to the Cobb-Edwards card. 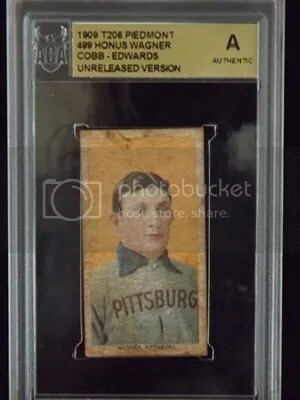 The paper used on the Cobb-Edwards card is old which leads me to believe that its probably just an early fake. Given all this information, it was no surprise that in the end they came to the conclusion the card isn’t the real thing. Most collectors that were already aware of this card have had that in their heads for years. As for the Canadian based ACA Grading. What little reputation they had in the industry has been blown out to sea. Treasure Detectives can be seen on CNBC Prime Tuesday nights @ 9:00 EST. They also run re-runs all the time.